An obscure knight of poor renown who collapsed roaming the land. Sturdy, owing to high vitality and stout armor. Longsword: A balanced, widely-used standard straight sword. Inflicts reliable standard damage, as well as high thrust damage. 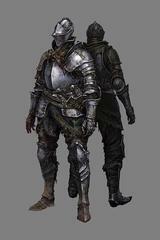 Knight Armor: Armor of a lowly knight, fashioned from solid iron. This iron armor might be on the heftier side compared to others of its ilk, but as such offers a great physical absorption in exchange for its imposing weight. Do not think to wear it without necessary vitality.